(UPDATE 7/27/2013) TEPCO just released (7/28/2013) the data on tritium from this observation hole (B1-1): 8,700,000 Bq/L. The observation hole No.1-2 has been consistently found with high levels of tritium, with most recent measurement at 350,000 Bq/L from the sample taken on July 22, 2013. 5,000 cubic meters, or 5,000 tonnes of this water is in the trench. It's one thing or another at Fukushima I Nuclear Power Plant, and now it's back to contaminated groundwater along the seawall. After sheepishly admitting the groundwater that got somehow contaminated along the way to the seawall may have been seeping into the sea after all (but only into the open culvert outside water intake canals enclosed by the silt screen, not even inside the plant harbor), TEPCO took samples from the trench for electrical wires and seawater pipe that connects Reactor 2 turbine building and the water intake for Reactor 2 in an effort to identify the source of contamination of the groundwater sampled along the seawall. The trench for electrical cables is where the extremely contaminated water was flowing freely from the Reactor 2 turbine building into the open culvert back in April 2011. The surface radiation level of that water in April 2011 was over 1 Sievert/hour (the survey meter went overscale). The Reactor 2 turbine building basement is filled with contaminated water that comes from the reactor building every day as water is being injected to cool the corium, though the density of radioactive materials is being diluted daily with groundwater that seeps into the reactor/turbine building. TEPCO just announced the result of the analysis of the sample taken on July 26, 2013 from the trench, and to be expected, the result was comparable to the highly contaminated water back in April 2011. Today (July 27), we would like to announce the result of the analysis of the sample taken on July 26 from a new observation hole in the Reactor 2 water intake electric cable trench (B1-1: at the foundation of seawater pipe trench) as follows. The numbers are comparable to those of the water leaked to the Reactor 2 water intake screen room, which happened in April 2011. It does look like the same water that leaked in April 2011, and it looks like the water has been sitting inside the trench after TEPCO managed to stop the leak. The density of radioactive materials in the water in the duct is higher than the water in the turbine building. The question is whether the water is leaking outside the duct, and how to find that out. When the highly contaminated water was found leaking (the red circle in the picture above), all TEPCO and everyone else cared about was the electrical cable duct - the one in yellow. I do not think TEPCO looked into the duct for seawater pipe - the one in green - at all. The density of radioactive materials for Reactor 2 seawater duct in the table above is the data from July 17, 2013 above. With the data from July 26, 2013, the density is in the same order of magnitude as that for Reactor 3 seawater duct. So, at least part of whatever is steaming on the operating floor of Reactor 3 is coming from inside the Containment Vessel after all. In addition to rainwater seeped in from a gap in the shield plug and warmed by the Containment Vessel head, there is an observable difference(3 m3/hr) between the amount of nitrogen gas being injected into the Reactor Pressure Vessel and Containment Vessel (16 m3/hr) and the amount of nitrogen gas being extracted (about 13 m3/hr), and it is possible that this gaseous body (3 m3/hr) containing enough water vapor is leaking through the Containment Vessel head. We presume that when the vapor leaks through the gap in the shield plug onto the 5th floor of the reactor building, it is chilled by the air which is relatively colder than the vapor, and is visualized as steam. Nitrogen injection into the Containment Vessel of Reactor 3 has been on-going since July 14, 2011. Start of nitrogen injection into Reactor 3 on July 14, 2011, only four months after the explosion, marked the completion of "step 1" of the famous "roadmap" to decommissioning. I wonder whether the difference in the amount of nitrogen going in and coming out has always existed. As per TEPCO's open admission (that no one apparently noticed or cared) during the press conference that the steam rising from Reactor 3 in March 2011 was from inside the Containment Vessel, it looks safe to assume that the difference, if any, has been leaking from inside the Containment Vessel all along. Whether the leak is through the CV head, as TEPCO says, or through somewhere else (like the open equipment hatch on the 1st floor) remains to be seen, I think. Now that TEPCO has figured out why the steam is rising, the company will resume the work to clear the debris from the Reactor 3 operating floor to "test the validity of the evaluation", according to the notice. By the way, the infrared thermography taken on October 14, 2011 seems to show the same location where the steam is rising now. The images use different temperature scales, but in both images the location temperature is between 30 and 35 degrees Celsius. It is just as hot today as it was in October 2011. (UPDATE) TEPCO now says it may be part rainwater, part leak from CV. See my latest post. and 30.7 degrees Celsius from 40 meters above. 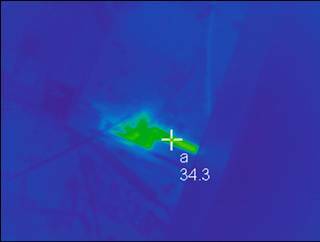 Infrared thermography seems to show an odd-shaped heat source, possibly partially covered by something else. TEPCO, who had finally taken infrared thermography on July 20 at the order of Nuclear Regulatory Authority but had done so on a wrong (sunny) day, re-did it in the early morning of July 24 with the similar condition as the day when the steam was first observed on July 18.
crane at the upper part of the Reactor Building, and it photographed at varying height. (UPDATE 7/25/2013) Just as back then, TEPCO now says the current steam may be from the Containment Vessel after all, at least in part. See my latest post. So that steam back then was actually coming from inside the Containment Vessel??? In the regular press conference on July 24, 2013, TEPCO's spokesman said the steam coming out of Reactor 3 in March 2011 after the explosion was from inside the Containment Vessel, and that is known to everybody. As you all know, speaking about the area near the shield plug of Reactor 3, it was around this area where the steam was coming from inside the reactor's Containment Vessel right after the accident [explosion of Reactor 3 on March 14, 2011]. We think the current high radiation levels observed around, near the shield plug, are probably due to the effect of that steam. "As you all know"??? Since when? As far as I remember, the explosion of the Reactor 3 building is explained by TEPCO as hydrogen explosion (initially some TEPCO workers, including Plant Manager Masao Yoshida, thought it was a steam explosion), but the company never explained where the steam seen rising from the wreckage of the Reactor 3 operating floor after the explosion was coming from. Now, according to TEPCO, everyone is supposed to know, as a matter of fact after two years and four months later, that the steam in March 2011 was coming from inside the Containment Vessel. I watched the Q&A section of the press conference, but no one seemed to be bothered by Ono's remark. Was it just me who didn't know about it as the established fact? I had suspected as much from the beginning, but didn't know that's now an accepted fact. How and what did I miss? I searched my own blog for Reactor 3's posts from the beginning, and the closest reference I found was that the steam looked to be rising from near the Containment Vessel. We are having experts analyze the situation, but at this point, the highest possibility, not confirmed yet, but the highest possibility seems to be that the steam is being released from some part of the Containment Vessel, just like it happened in Reactor 2. Since it is radioactive steam that was inside the Containment Vessel, high levels of radiation were observed temporarily. Let me repeat that it is not yet confirmed, but that is the most likely scenario at this point. In the afternoon press conference at 6PM on March 16, 2011 (link is in Japanese, Asahi Shinbun), Edano somewhat backed off and said he had heard the steam might be from the suppression chamber (it is still part of the Containment Vessel, I suppose, but below the 1st floor). NISA thought the rise in radiation levels at the plant in the morning of March 16, 2011 was because of Reactor 2, not Reactor 3. Mr. Edano talked about it as the hypothesis, that the steam rising from Reactor 3 after the March 14, 2011 explosion was from the Containment Vessel, and that was 2 years and 4 months ago. I do not think (I may be wrong) anyone paid attention to this particular remark or followed up on it. But now, according to TEPCO, that's what everyone should know, that the steam seen rising from the Reactor 3 wreckage in March 2011 was from the Containment Vessel. Moments ago, an unlikely grouping between a 33-year old Republican, Rep-Justin Amash, and an 84-year old Democrat, Rep-John Conyers, resulted in a House vote, that if passed, would have suspended the NSA's "indiscriminate collection of phone records" and effectively ended the program's statutory authority. Yet despite significant lobbying by the White House, security experts and representative on both sides of the aisle, the vote came within a startlingly close 12 votes of passage. A majority of Democrats, 111, voted for Amash's amendment despite the full court press while 83 Democrats voted no. The GOP vote was 94-134. That the vote did not pass is not surprising. However, that it came to just 12 votes of passage is the stunning development and shows a sea change of how Congress approaches both personal privacy and the broader implications of the Patriot Act. All of it thanks to the action of one man who at last check was still stuck in the transit terminal in Moscow. Representative Justin Amash is an 33-year-old libertarian Republican of Palestinian and Syrian descent. Hayek and Bastiat are his favorite economists, according to his wiki entry. Representative John Conyers is the second-longest serving incumbent in the US Congress. He is a liberal in the traditional sense, and the Founding Member and Dean of the Congressional Black Caucus. And who are the people who were dead set against the bill? Despite their threats and pressure, 57% of Democrats voted for the bill, and 41% of Republicans voted for the bill. Reactor 1, 1st floor: 4,700 millisieverts/hour (or 4.7 Sieverts/hour) where steam was gushing from the floor, locations over 1,000 millisieverts/hour nearby. Reactor 1, 2nd floor: over 1,000 millisieverts/hour (or 1 Sievert/hour). Precise measurement was not done. The survey meter went overscale. Reactor 2, 1st floor: (surface radiation level) 3,000 to 4,400 millisieverts/hour (or 3 to 4.4 Sieverts/hour) on the upper penetration hole on the Containment Vessel. Reactor 2, 2nd floor: (probably surface) 330 to 1,640 millisieverts/hour (or 0.33 to 1.64 Sievert/hour) on X29B/C penetration hole. Reactor 2 Turbine Building Basement: over 1,000 millisieverts/hour (or 1 sievert/hour). Reactor 3, 1st floor: 2,290 millisieverts/hour (or 2.29 Sieverts/hour) along the rails for the equipment hatch. 4,780 millisieverts/hour (or 4.78 Sieverts/hour) on the floor surface. Radiation measured on the 5th (top) floor of Reactor 3 (2,170 millisieverts/hour max) is in line with the levels measured on the 1st floor along the equipment hatch rails. As a reminder, that hatch was found open, and high radiation along the rails was from the steam or water leaking out from inside the Containment Vessel. Packbot did the cleanup of the hatch rails twice, and the towels that the robot used were soaking wet in the video from November 2011. Packbot went in to clean the rails in November 2011, and TEPCO finally admitted that the hatch was open in April 2012. As usual. If the steam seen on the top floor of Reactor 3 is from inside the Containment Vessel, I would think the radiation level should be in 1,000s, instead of 100s. This does not necessarily mean that the steam is radioactive, as the top floor (or what's left of it) of Reactor 3 after the March 14, 2011 explosion remain highly radioactive. There has been only one measurement of radiation (page 30 of the link), probably from the boom of the crane, above the top floor of Reactor 3, and that is 500 millisieverts/hour (at 8 meters above the floor, if I remember right, but not 100% sure). TEPCO measured the radiation levels at 25 locations in the area around where the steam has been observed (the entire shield plug). Maximum was 2,170 millisieverts/hour, minimum was 137 millisieverts/hour. Radiation level at the location where the steam has been observed was 562 millisieverts/hour. Radiation levels are simply too high for human workers to investigate on the floor, which is not negotiable at all by robots either because of debris. If the steam was coming from inside the Containment Vessel, I would assume the location would see much higher radiation level. (UPDATE 7/23/2013) TEPCO measured the radiation levels around the area. See my latest post. It rained in the morning at the plant. So, just like the previous incident on July 18, this one is explained as rainwater hitting the warm (about 40 degrees Celsius) Containment Vessel Head. At Fukushima I Nuclear Power Plant, what looks like steam is seen rising from the top floor of Reactor 3 building on July 23, following the same incident on July 18. As there is no change in radiation level above the building, TEPCO thinks it is the rain in the morning that seeped inside the building and warmed up. The company continues to monitor the situation. According to TEPCO, the image captured by a video camera installed [on the top floor of Reactor 3] showed what looked like steam rising from the floor of the Reactor 3 building on 9AM on July 23. There is no change in radiation level above the building, and the cooling of the reactor and the Spent Fuel Pool is stable. There is no data that indicate abnormality, according to TEPCO. Since the steam was first observed on July 18, TEPCO has stopped the work to clear the debris on the operating floor of Reactor 3. Nuclear Regulatory Authority told TEPCO to take infrared thermography of the location under the condition similar to the fist incident (raining), but TEPCO only heard the first half of the order - take infrared thermography. And take they did, on a sunny day on July 20. I wonder if they had wits about them to take thermograph today (July 23), when it was raining. It looks like TEPCO will have another chance on July 24 and 25 (weather forecast in Fukushima is rain). LDP and Komei won 76 seats together, bringing the overall number of seats in the Upper House (including the seats not contested this time) to 135, well past the simple majority of 121. DPJ collapsed from pre-election 44 to only 17, even though it is still the 2nd largest party overall. It was almost funny to see the media, both newspapers and TV, keep telling the voters throughout the day and evening on July 21 (the election day) that the voter turnout was going to be so low that it would be the record-low. Here's Mainichi, saying the voter turnout as of 6PM was only 32.64%, and it was low across the nation. However, Yomiuri reports that the final turnout two hours later at 8PM was 52%. It is still low, but above 50% and not the record-low like the media has been telling the voters. It seems 20% of voters showed up in the last two hours of voting, except for places where the voting was finished earlier (35% of all voting stations nationwide). What's not so good is this, also from Asahi - overall numbers of Upper House Councilors of each party. To LDP and Komei, add Boy-wonder's Japan Restoration Party and Your Party whose policies are hardly different from those of LDP; you get the two-thirds majority, enough to change the Constitution. Abe has already declared that what he is going to do, now that he has the "mandate", having won both Houses of the Diet. For sure, Komei Party says it is against the radical change of the Constitution as proposed by LDP, but it still wants to modify certain clauses. There are DPJ politicians who are for changing the Constitution. After the win of Yamamoto was confirmed, I was surprised to see some of the influential experts on Twitter resorted to propagating totally false information about Yamamoto. They are people who think the fear of radioactive contamination in Japan and particularly in Fukushima Prefecture is way overblown. As far as I have followed, they have so far not resorted to manufacturing a lie about people they do not agree with, and they are usually the ones who appreciate accuracy in data. But not this time. One such expert tweeted that Taro Yamamoto is "racist" (against people in Fukushima, he means; at least he doesn't use the transliterated katakana word) because Yamamoto just said in an NHK interview that the agricultural produce in Fukushima was nuclear waste. Yamamoto said no such thing, as it turned out. He said 100 Bq/kg contamination had been considered nuclear waste until the Fukushima accident, and after the Fukushima accident it is the safety limit for food. I have problems myself with some of Yamamoto's opinions and understanding of things, but I didn't expect these experts to manufacture a lie like this to attack someone they don't agree with. The other phenom in the election, Yohei Miyake, didn't win in the proportional representation part of the election for the Green Party, but he got over 150,000 votes (the highest in the Green Party). He has declared he will run again in three years in the Upper House election, and says he's glad his movement contributed to the win by Yamamoto.